Amazon Prime members get a lot of benefits, including free 2-day shipping and unlimited access to Amazon’s video and music streaming services, to name a few. 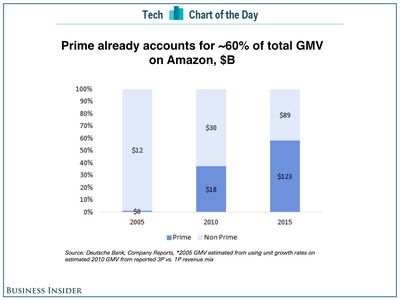 According to Deutsche Bank’s own estimates, Prime users’ spending now accounts for nearly 60% of Amazon’s gross merchandise value (GMV), or the total value of the goods sold on its site. That’s a lot of money given Prime users represent less than 20% of the total Amazon customer base.